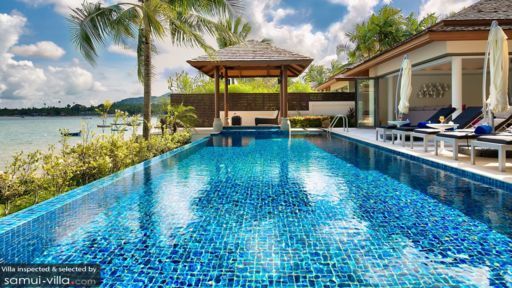 Baan Benjamart is a waterfront vacation complex which consists of four pavilions – all highlighting contemporary tropical elegance. Interiors are appointed with mostly complementary, finely finished as well as woven wood furnishings and fixtures with a number of classic and luxurious pieces. Amenities are expectedly of hotel and resort quality – to insure sheer guest satisfaction and leisure. Truly, Baan Benjamart gives you a distant and dreamy getaway with a seaside character. The four air-conditioned bedrooms of the villa are housed in three pavilions – the master bedroom and two guest rooms are in two cliff side bedroom pavilions on stilts, and one guest room is in the living pavilion. The master bedroom, in one of the bedroom pavilions, has a four-post and draped, king-sized bed, as well as a dedicated bathroom with a fitted bathtub and a rain shower. The two guest rooms – in the other bedroom pavilion – both have king-sized beds, as well as dedicated bathrooms with rain showers. All three bedrooms open out to a long balcony. Linking the two bedroom pavilions, this balcony has breathtaking views of the distant horizon. One more guest room – in the living pavilion – also has a king-sized bed (can be converted to single beds), as well as a dedicated bathroom with a rain shower. 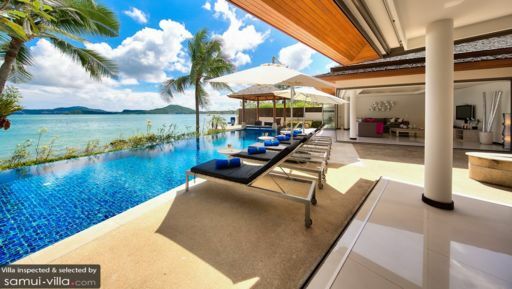 By the beach is the 17-meter infinity pool. After ceremoniously reconnecting with the ocean, leap into its refreshing, crystal clear waters and revel in your element. Out of the water, you can laze on woven wood pool beds partially shaded by large umbrellas on poolside stone and tiled decks. 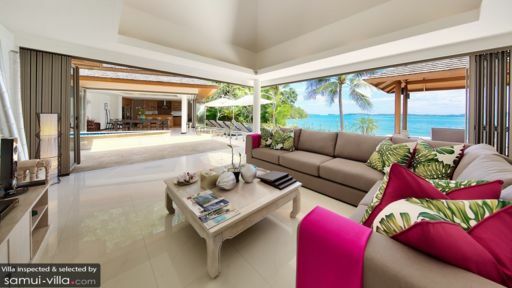 Or, settle comfortably on the cushioned, woven wood couch under the shade of the sala that looks out to the beach. The villa has a semi-open, sunny and airy living pavilion with hefty, leather couches in front of a wall-mounted, widescreen TV. Here, you can all anticipate the newest episode of the latest blockbuster series. Or watch, once again, your all-time, favorite classic film. Just across is the dining pavilion. On its square, dark wood table that seats 10, you can all relish authentic Thai cuisine – as well as your most requested comfort food – meticulously put together by the onsite chef at the fully-equipped, ultra-modern kitchen behind the dining area. The counter which delineates the kitchen also doubles as a bar where you can grab a bite, hydrate or raise a toast. The villa’s amicable staff doesn’t just dispense the daily services. The staff members also guarantee that your stay is truly convivial. Baan Benjamart is located within Bo Phut Beach. Right at the villa’s doorstep are waters ideal for swimming. Walk around the two-kilometer coastline and you’ll get to Fisherman’s Village. Marvel at the old-world edifices, as well as at the bargains available during the Walking Street – if you happen to be there on a Wednesday. On another excursion, include in your itinerary the Samui Big Buddha and the Samui Crocodile Farm. Then feed your need for speed at Samui Go Cart.